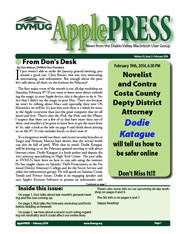 The current issues of DVMUG’s award-winning monthly newsletter are available to members only. If you are looking for the most recent issue, check our weekly email or our BBS. Files will open in OS X’s Preview or Adobe’s Reader. File sizes are generally 1 to 1.5 MB.